I have been putting my new Bernina 820 through its paces this week. 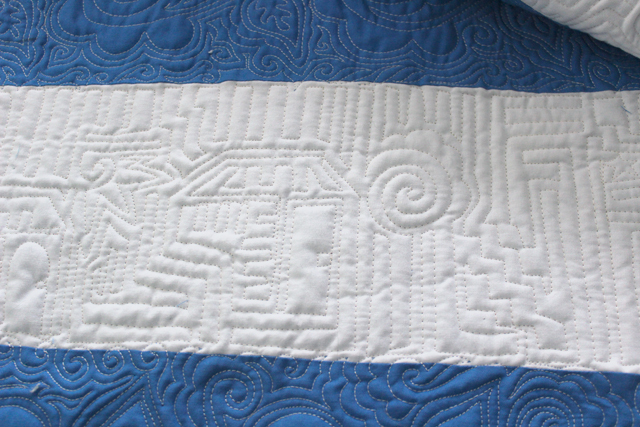 I stitched these doodles on a striped blue and white quilt. Gardens in the blue stripes and houses in the white stripes. Because I am still getting used to my sewing machine, it took me a bit of “tweaking” to get the tension just right, but once I did I was on a roll…The Bernina 820 has a huge bobbin, so I didn’t need to stop often. 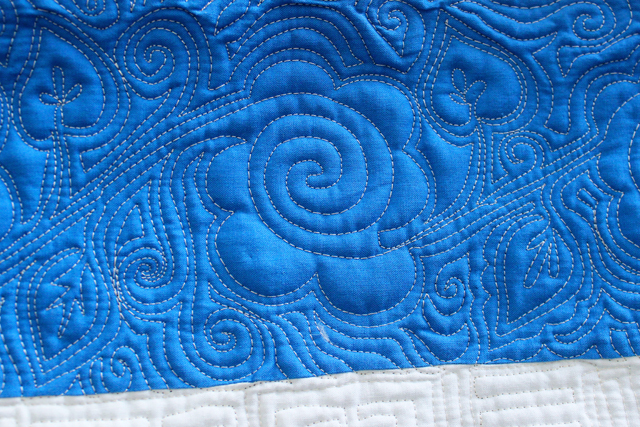 The Blue stripes began with The Fabulous Flower (see tutorial HERE). Then I did a technique I call “layering in” to add more leaves, spirals, and flowers. Now that I have this quilt finished, I have no excuse not to clean my house and tend my garden! 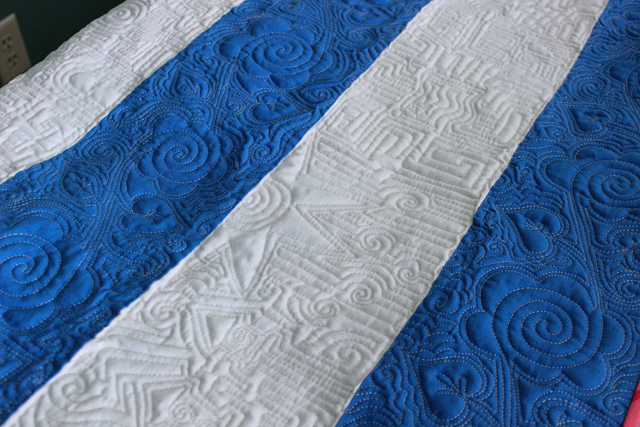 Later this week, I will reveal My Secret Weapon for free motion quilting large quilts! Next week: A fabulous Stencil Giveaway! Loove the harp space–the only reason I bought it, but I love some of the other features too! This is so beautiful, Lori – I read in one of your blogs that you were looking for an alliteration to go with Thursday and I think of thread. LOL! I seem to always miss the obvious! I will definitely use that–thanks! Cant wait to hear your secret! I will reveal it this week! 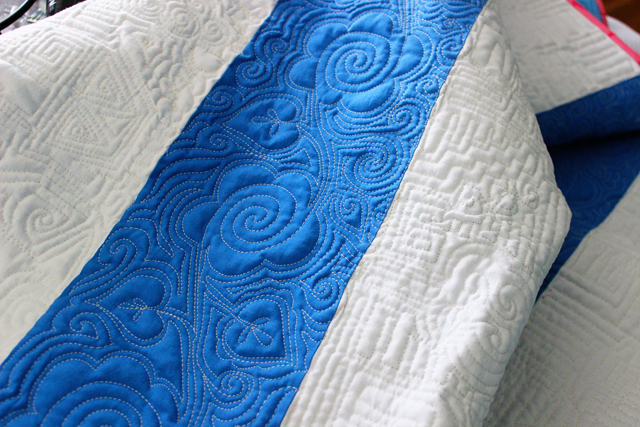 Gorgeous quilting work!! You really put your heart into it and it shows! I have the 440 with the stitch regulator. I go back and forth between it and the regular FMQ foot, depending on how much control I want. 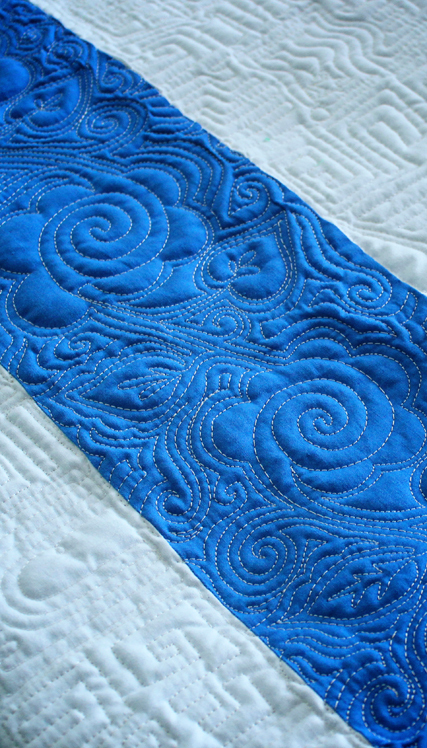 I tried the stitch regulator, but because I learned FMQ without one, I found it distracting. Which do you like better? It depends. 🙂 I started with the stitch regulator and if I want to try a new design I’ll use it, because I don’t have to think about speed or stitches, just concentrate on the design. For more control, I use the regular foot. Really pretty and very summery! The 820 does have a stitch counter – I think it’s under the settings button – it just gives the total number of stitches though, so you’ll need to check it at the beginning and the end of your project. Thanks for the tip. I will definitely use that function on my next Doodle Quilt. Have you ever used it to count stitches in a quilt? Stunning and so much fun! I love the houses you quilted in. I think you will find the 820 has a stitch counter. Maybe read the manual? I will check the manual. I didn’t think of it until after the quilt was nearly complete!! Beautiful! Can we see a picture of the while quilt? Gulp. That is unbelievably amazing!!!!! Thanks! It is do able — see the tutorials. 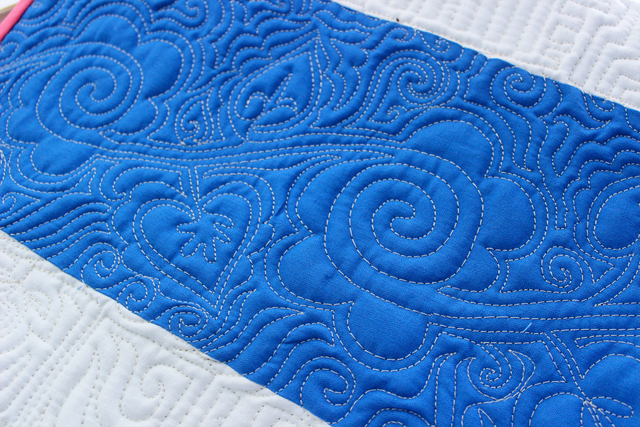 The rose garden pattern in the blue is mind blowing. And once I realized that those were houses, I think I fell in love. At first sight I just loved the texture in the white areas, but having a second look made me see the houses as well. Thrilled you liked it! The rose flowers are in the tutorials above. Much easier than they look! I know Bernina830 does have a way the stitches are counted. When I have my machine serviced, they tell me how many stitches I had put on my machine. Also, I look forward to your blog/tutorials daily! Thanks for sharing your incredible talents. I guess I’ll actually have to read the dreaded owner’s manual! I’m am truly happy that you are enjoying The Inbox Jaunt! Let me know if you have any suggestions for posts.